Before joining the Department of Atmospheric Sciences in 2012, Janel Hanrahan earned her Ph.D. in Mathematics with a strong focus in Atmospheric Sciences from the University of Wisconsin-Milwaukee. Her doctoral work included the investigation of Lake Michigan-Huron water levels and their connection to natural climate variability and anthropogenic climate change. Following graduate school, Dr. Hanrahan worked as a researcher at the University of Alberta where she studied changes in rainfall in the Canadian Plains region and examined procedures for model optimization. Through dynamical and statistical downscaling, she is currently interested in identifying connections between large-scale climate variability and trends and local weather, particularly extreme precipitation. 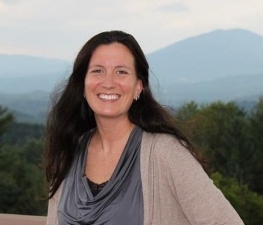 At Northern Vermont University-Lyndon, Dr. Hanrahan has enjoyed interacting with students on a personal level both in and out of the classroom. She earned her own B.A. from a small student-centered institution and was excited to return to this type of learning environment. Because of her own interest in applied mathematics, she enjoys helping students understand how math and physics are used to study the atmosphere. In addition, Dr. Hanrahan is interested in improving climate change literacy among both atmospheric scientists and the general public. As the director of The Climate Consensus, she works with students, faculty, and staff to improve climate change communication among these groups through the creation of shareable digital content, participation in community outreach events, K-12 school visits, and conference presentations. Originally from the Midwest, Dr. Hanrahan has been enjoying the Northeast Kingdom’s natural beauty. She and her husband keep busy with ongoing home renovations (with energy efficiency in mind! ), gardening, cooking, food preservation, and exploring the surrounding area. Most importantly, she is busy being a mom, a role that has opened her eyes to the very real consequences of unmitigated climate change. Therefore, she spends much of her time educating family and friends about the science and encouraging other scientists to do the same. Hanrahan, J., and J. Shafer, 2019: Improving climate change literacy and promoting outreach in an undergraduate atmospheric sciences program. Bull. Amer. Meteor. Soc. https://doi:10.1175/BAMS-D-17-0332.1, in press. Hanrahan, J., A. Maynard, S.Y. Murphy, C. Zercher, and A. Fitzpatrick, 2017: Examining the Climatology of Shortwave Radiation in the Northeastern United States. J. Appl. Meteor. Climatol., 56, 2869–2881, https://doi.org/10.1175/JAMC-D-16-0420.1. Hanrahan, J. , Kuo, C. and Gan, T. Y., 2015: Configuration and validation of a mesoscale atmospheric model for simulating summertime rainfall in Central Alberta. Int. J. Climatol, 35, 660–675, https://doi.org/10.1002/joc.4011.